Welcome to the official discussion thread for Splatoon on the Wii U! To start, please add this game to your log, add it to your collection (if applicable), and (when you are ready) rate it using the link above! Splatoon is Nintendo's unique twist on the shooter genre. Shoot ink on both your friends and environments to win the match! 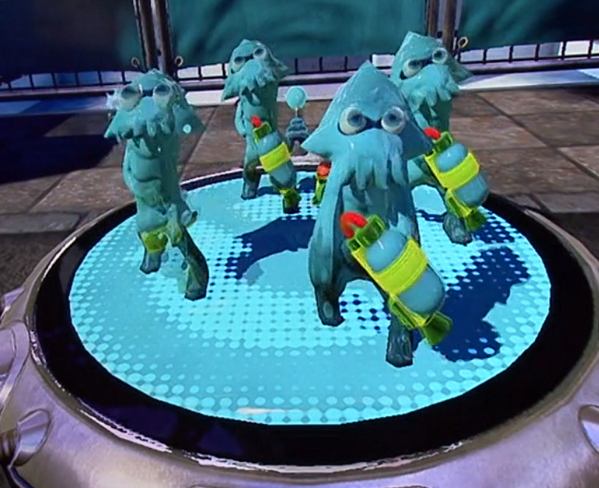 Players can turn into squids and 'swim' through their team's ink color. Players can also use their team's ink color to slow down enemy movement. It's ink or be inked in this chaotic marriage of third person shooters, de Blob, and good ole fashioned paintball. Any word on online features? Seems like a game where voice chat would be really critical (which is worrisome). I'm convinced Splatoon will be Nintendo's best Playstation 4 console ever. We probably won't hear about features for a while, since it's a 2015 game. For some reason Nintendo likes to stay mum about stuff like this until closer to release. Despite that one concern, I must say the game looks great. Completely fresh in an otherwise wearisome genre. I can't wait to give it a try when it hits. With enough variety to the levels, modes and the special weapons this game could go far. Personally I'd like to be able to make some subtle modifications to my character to make it feel like "mine". I dig the way they look now, but it'd be cool to be able to select pants, shirt or accessories. Can't imagine this sort of thing will be a priority, and I won't be disappointed if it's not in there, but I'd like it. @Jargon I would think so, at least with friends/teammates, right? I imagine they don't do it with Mario Kart because 12 people talking at the same time could be chaotic. I'm wondering if there will possibly be a two player splitscreen/online mode. I'd hate to not be able to play this with Amanda. The Gamepad usage seems pretty integral (tapping on players to jump to their position), but that feature didn't seem like something they couldn't duplicate by just cycling through players with the stick or pointing at them with the Wiimote. Even just having one player on the Gamepad would be cool, though I'd still want that big screen real estate. Didn't they say you could two players with one on the Gamepad and one on the big screen? Or am I making that up? @Jargon It sounds so familier but I can't remember if it was in regards to Splatoon or another game. Yeah, which is an AWESOME feature that EVERY MULTIPLAYER GAME EVER MADE FOR WII U NEEDS TO HAVE. You hear me, every developer in the world? Make this happen please! This type of game gets me really excited to play multiplayer. Have we heard any details about the types of weapons that will be available? I think I saw a sniper type weapon, a bomb/grenade type weapon, and of course the assault rifle. Highlight of the show for me, even though I'm perfectly willing to admit it doesn't yet look like a AAA Nintendo effort. What I like about Splatoon is it's perfectly new, even if it's in a well worn genre. Sequel fatigue has been setting in with me, lately. I think that's why I've drifted towards Nintendo efforts like Rolling Western, Pushmo, Uprising and stuff like that over, say, a game that reminds me I already own 7 other versions just by looking at the title. Or, at least, sequels where I haven't played the earlier games to death (Awakening, Pikmin 3, Tropical Freeze). Anyway, I'm really fired up about Splatoon. I just hope that the strategy aspect really pays dividends and it's not about luck. Man, this could be our Team Fortress. I can't wait to play it with you guys. Pro Jared (youtuber) said he asked and was told it has full voice chat. Not really official though but it might point to something. It was in his Splatoon Thoughts video. This game is phenomenally fun. Believe the hype. Completely fresh, addictive, nonstop action, creative concept that works beautifully. Played it 3 times, loved it every time! The Nintendo reps asked me if what I liked and what I'd change. I said the gameplay was terrific, and the only request I had for the final product was lots of options for the fights. One of my top 5 games shown. I just love the style of it all. Did you ever get to try out that super weapon or whatever they called it? I'd like to know more about how that works as compared to the standard one. Also: Does enemy ink on the floors actually harm you at all or does it just slow you down? Seems like a very strong core concept with lots of opportunities for insane weapons and whatnot, can't wait to see how it develops. I hope there is some kind of a single player component as well as the multi, doesn't have to be a massive experience but something more fleshed out than Steel Diver 2.